Save the Date! May 7 – 9, We are at Airport Show 2018, Dubai, stand no. 6500! Come and visit us, we will be waiting for you! On May 7 – 9, Airport Show 2018 will take place in Dubai at the Dubai World Trade Centre. Recognized as the world’s largest annual airport exhibition, Airport Show is an ideal platform for the Middle East, Africa and South Asia’s aviation authorities to gain first-hand knowledge of emerging aviation trends; network with global industry leaders; and source the latest technologies. 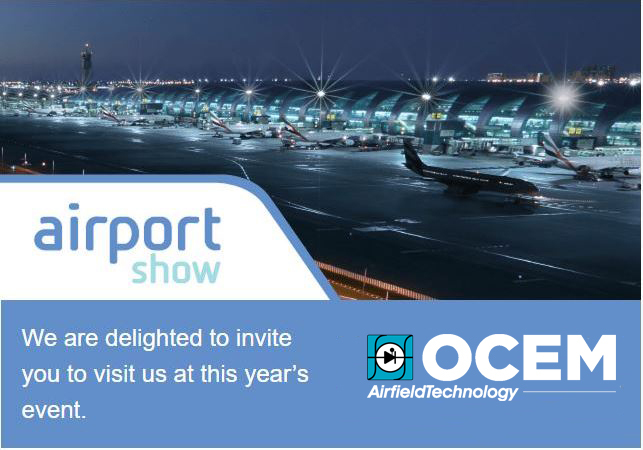 Now in its 18th edition, Airport Show brings together leading international suppliers offering the most advanced airport solutions, and OCEM Airfield Technology is a guaranteed guest every year. The event attracts more than 7,500 people each year, with 350 companies and 90 visiting countries represented. It’s a unique occasion to meet aviation decision makers and experts. OCEM is pleased to invite you to come visit us at stand No. 6500, where our team will welcome you and help you discover all the features that make OCEM’s products a complete and reliable solution for making your airport shine. We will be waiting for you at stand No. 6500! OCEM Airfield Technology is a leading global airfield lighting provider with close to a century of experience in the airfield industry. It has supplied AGL solutions and systems to more than 1,150 airports and installed more than 235 airfield control monitoring systems worldwide. Based in Italy, together with Multi Electric (U.S.) and Augier (France), OCEM forms part of Aretè & Cocchi Technology, a holding group focused on high-tech businesses leading industrial fields.